Cricket - Illingworth v Kirkstall. Ben Clarke bats for Illingworth. 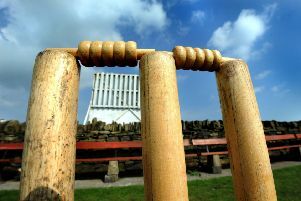 Illingworth St Mary’s CC are bidding to return to the Spenser Wilson Halifax Cricket League after an absence of almost 100 years. The Airedale and Wharfedale League club have applied to rejoin the Halifax League in 2017, a decision they say is approved by the vast majority of the club’s players. Illingworth President Andrew Smith said: “We have made the application with the full permission and understanding of the Airedale and Wharfedale League with whom we have a very good relationship. “In recent months we have given a lot of thought to the long term future of the club and the clear message coming from our players is that the amount of time spent in travelling to away matches is too great. Illingworth representatives will state their case for inclusion with a presentation at the Halifax League meeting in February. Their application will be voted on by the current Halifax League clubs at the April meeting with a straight majority required to be successful. Illingworth secretary David Lawton said that if the club’s application was successful there would be some regrets about ending a 55-year association with the Aire/Wharfe League. However, the positives would outweigh the negatives. “The world we live in continues to change and we have to change with it if we are to survive and prosper,” he said. Illingworth believe their facilities at Jammy Green compare favourably with those of most clubs in the Halifax League and their membership would be of mutual benefit. They would also not have to pay the expenses of an overseas player so could concentrate putting resources into improving facilities. The 1919 Halifax Parish League, which dropped the word ‘Parish’ in 1926, comprised just nine clubs and re-entry would unite Illingworth with its three surviving founder members – Greetland, Sowerby Bridge and Triangle. There are other existing connections too. The Illingworth third XI was one of the founder members of the Halifax Sunday League in 1985 and has been a continuous member ever since. Illingworth junior teams have also had a long tradition of playing in the Halifax Junior Leagues.